Ellika & Solo first met on the stage of a club in Stockholm in 1998. There, Senegalese folk music or griot music, met the Swedish polska. Solo is a bearer of his people’s history from a very long story-telling tradition, Ellikas' music has deep roots in the wildly joyous story-telling tradition of Bingsjö. Together they make music where song, combined with the kora’s rythmical flow, form a colourful platform for the polska. 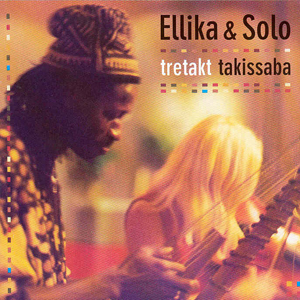 Ellika & Solo have toured in the USA, Africa, Greenland and many parts of Europe. Their ongoing dialogue between fiddle and kora feels just as exciting and unpredictable now as it did on their last outing. Solo Cissokho, kora, is a griot, that is a musician-come-storyteller. He was born in Ziguinchor in Senegal and learnt to play the kora, the West African harp and instrument of the griot, at the age of seven. Today Solo lives in Norway. Solo is an inquisitive player willing to test new contexts for his music. He has played not only with Norwegian folk musicians and the Indian violinist Subramaniam, but even with other African musicians such as Tore Kunda, Youssou N’Dour, and Ali Farka Touré. Ellika Frisell, fiddle, viola, is a folk musician, born in Stockholm who plays Swedish folk music in the Bingsjö-and Orsa traditions. She plays music given her by such masters as Nils Agenmark and Gustav Päkkos, but also studies South Indian classical music with K.Shivakumar in Bombay. Ellika has played with many folk music groups such as Filarfolket, Den Fule and Rosenbergs Sjua.